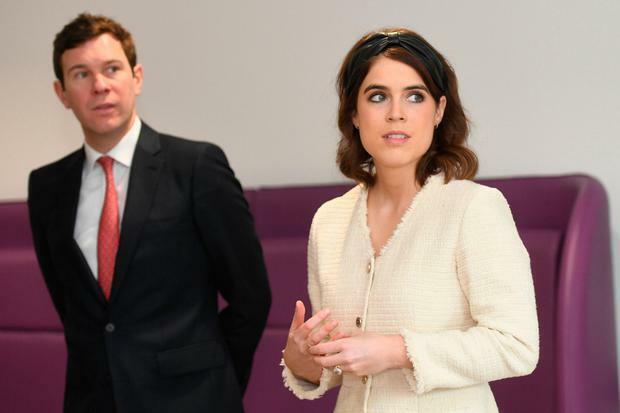 If there's one things royals love, it's a hair accessory and Britain's Princess Eugenie added the perfect injection of youthful elegance during her first official engagement since her wedding last year. Eugenie, who made positive headlines around the world when she showcased her scoliosis surgery scar in her wedding dress, joined her father Prince Andrew and husband Jack Brooksbank for a visit to the Royal National Orthopaedic Hospital (RNOH) in London to officially open the new Stanmore Building. Although Eugenie isn't a full-time royal (she works as director of art gallery Hauser & Wirth), she joins her father and grandmother Queen Elizabeth on select occasions and uses her profile to boost personal causes. It was also favourable timing as Meghan Markle is officially on her maternity leave preparing for the impending arrival of her first child with Prince Harry and Kate Middleton is in the process of stepping up her own role to play a more central part in the family business, but the appetite for royal content remains as voracious as ever. The 28-year-old went for a contemporary twist on vintage elegance, wearing a cream tweed dress by Maje, a pair of black suede pumps, shunning the traditional clutch in favour of Chloé's Nile small bracelet bag and a leather headband, in a subtle fashion power move which has separated her from the inevitable comparisons between her famous family members. She's previously championed the look at Christmas service in December, spurring more than a few websites to note the similarities between her ensemble and that of Gossip Girl's Blair Waldorf. At the age of 12, Eugenie underwent eight hours of surgery to correct a spinal misalignment at the RNOH and is a patron of the hospital. "During my operation, which took eight hours, my surgeons inserted eight-inch titanium rods into each side of my spine and one-and-a-half inch screws at the top of my neck. After three days in intensive care, I spent a week on a ward and six days in a wheelchair, but I was walking again after that," she said last year. "Without the care I received at the RNOH I wouldn't look the way I do now; my back would be hunched over. And I wouldn't be able to talk about scoliosis the way I now do, and help other children who come to me with the same problem. My back problems were a huge part of my life, as they would be for any 12-year-old. Children can look at me now and know that the operation works. I’m living proof of the ways in which the hospital can change people’s lives." In recent months, she has has become a more visible spokesperson for other scoliosis sufferers and told the Telegraph in December that she has found a sense of healing in sharing her journey to self-acceptance. "Your scars are a way of communicating, and sharing a trauma can be healing in so many ways. It can release that stigma you might have given to yourself and by talking about it you can show people how they can heal, too. I believe scars are like memories that tell a story on your body, that remind you how strong you had to be, and that you survived to talk about it."